1. The process of beating an ingredient vigorously to incorporate air, which makes the ingredient frothy. 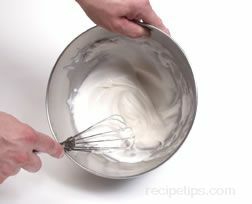 For example, egg whites are whipped until they form stiff peaks and heavy cream is transformed into whipped cream. 2. A light dessert prepared with whipped ingredients such as egg whites or whipped cream into which are folded pureed fruit, chocolate, or sweet spices for flavoring. 3. A utensil used for mixing food ingredients being prepared for baking or serving. A whip is basically a larger version of a whisk. Whisks range in size from 6 inches to over 24 inches in length, while a whip typically will range in size from 24 inches to 60 inches in length.